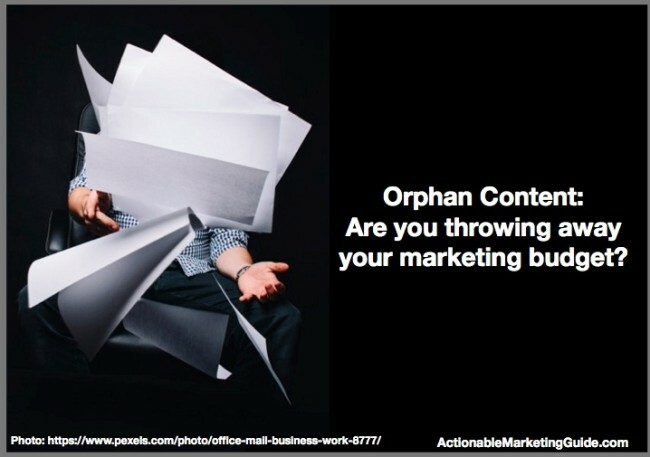 Orphan Content: Are You Throwing Away Your Budget? Is your content a forgotten orphan like Oliver Twist? 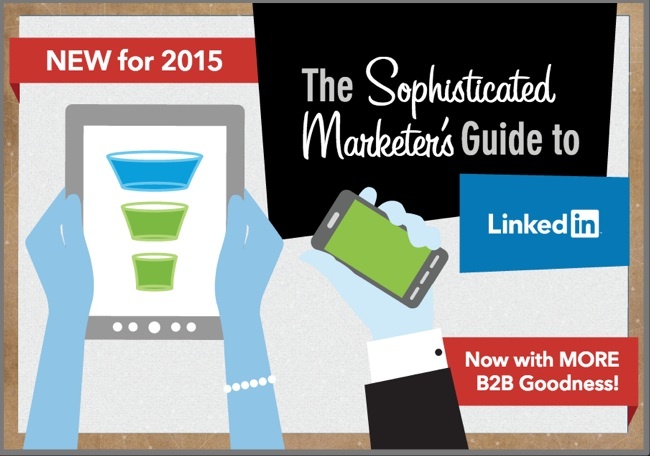 Before you answer, consider that 60-70% of what B2B content marketers create is orphan content. This isn’t a lone statistic. 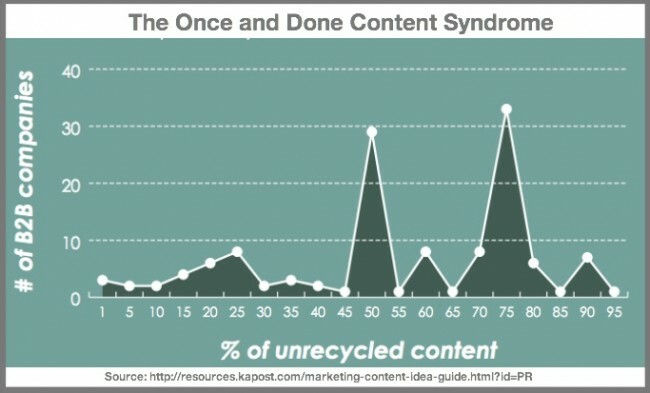 75% of marketers use a piece of content ONLY one time according to Kapost research. Even worse this data doesn’t tell you how much content budget is wasted on stand-alone, orphan content efforts!!! Despite your best intentions, you’re stuck on the non-stop content creation treadmill. You’re under increasing pressure to create more and content. As a result, you don’t have time and resources to focus on effectively publicizing your existing content. Your content at least gets its initial love. The challenge is to give your content what it needs to extend its lifespan and improve your content ROI. Orphan content is forgotten, unloved content that goes unviewed and unused after its publication and initial (and generally only) promotion. No internal links. Like an orphan, it’s got no family connections. Links support your search efforts and keep people on your site. Add internal links to other content on your site or blog. 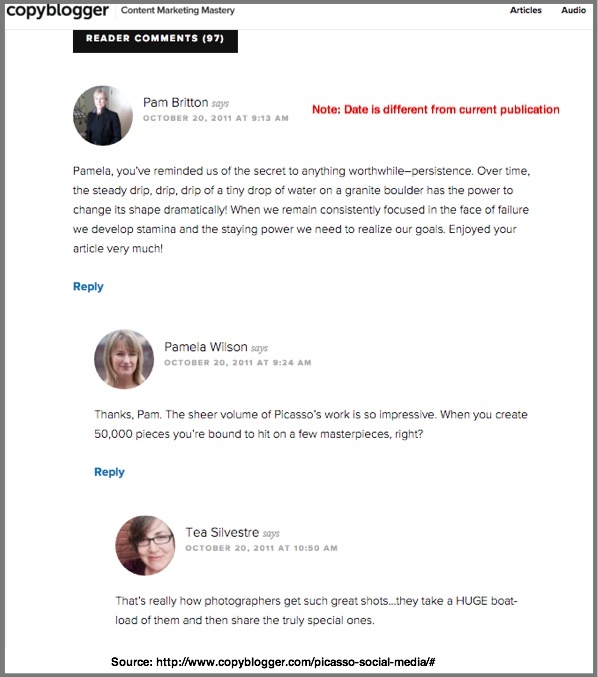 Also link to new content from existing content when you publish. No on-going promotion, social media shares or curation. Like an orphan, it’s not invited to celebrations and gatherings. Content needs to get out and strut its stuff on a regular basis or it’s forgotten. Just like buying a new outfit for a party, you need to change your content presentation. No updates. Like an orphan, your content is left to fend for itself. Adding new insights and bringing content up-to-date is critical to maintain evergreen content. It shows your audience and search engines that you care about it and that it’s still useful. Today’s perform or die content landscape fosters orphan content. Reason: Marketers focused on churning out more, new content rather than maximizing each content effort. Result: More one-off content efforts to respond to current needs rather than maximizing long-term content ROI. According to Moz’s Rand Fishkin, the biggest content marketing misconception is assuming your audience will take an action towards purchase after reading just one piece of your content. Rather content marketing is a long-term process. Like many sports, it requires a team of content, not just a single piece. Like traditional media advertising, buyers generally need to see multiple pieces of content from your organization at different times to make them predisposed to purchase from your firm. Moz estimates their visitors make 7.5 visits before they sign up for a free trial. Take a page from Moz’s playbook measure at every step of the process towards purchase. Include a contextually relevant call-to-action and landing page. When it comes to orphan content, there’s no catch. The last thing that your overloaded audience needs is another piece of content. Your existing content needs budget love to eliminate orphan content. It’s much easier than creating fresh content and increases your content longevity and content ROI at the same time. What boss can say no to that? Why wait until your content is forgotten to give it some loving attention? Put it into your content promotion calendar. Include social media and owned media. Edgar’s Laura Roeder recommends tapping into algorithms to maximize your content reach keeping your social media shares alive on various platforms. This way you and your audience don’t forget about it. 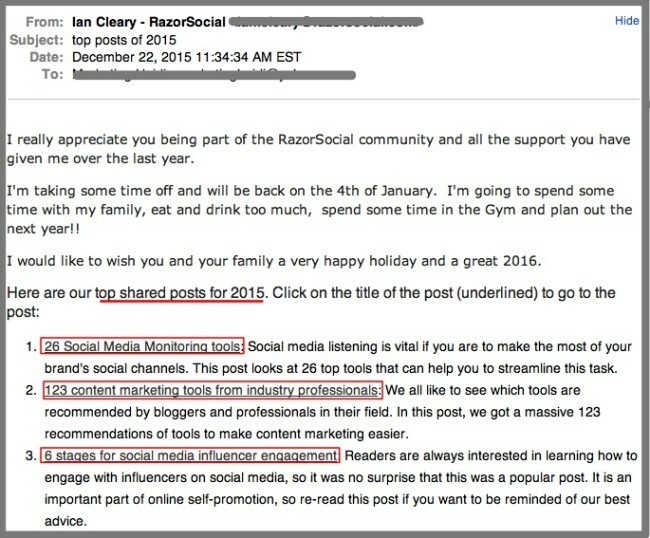 Razorsocial’s Ian Cleary spotlights older articles in his email newsletters. I’m sure it drives new readers to existing content. Noah Kagan of AppSumo recommends re-mailing your email newsletter a few days later to increase email opens. Of course, suppress recipients who already opened it. Either hand curate or use a tool to show related articles at the end of each article. At a minimum, examine your content annually in your content audit. Also reassess existing content when you’re writing related or seasonal content. LinkedIn’s Jason Miller did this with his highly successful guide. Extend your content’s reach to new audiences by transcribing your articles into another media format. 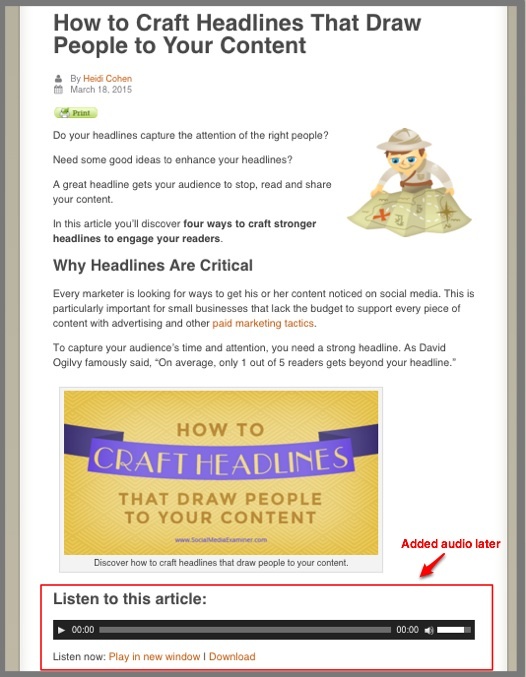 For example, Social Media Examiner creates an audio version of strong posts. Alternatively, create a download. OKDork (Kagan’s blog) does this. It helps increase visits and email signups. Don’t just republish the same content everywhere. This creates duplicate content that Google doesn’t like. Instead use a different spin while keeping your focus on the same keywords and link to your original content on your site. Take advantage of the bigger audiences other platforms have. 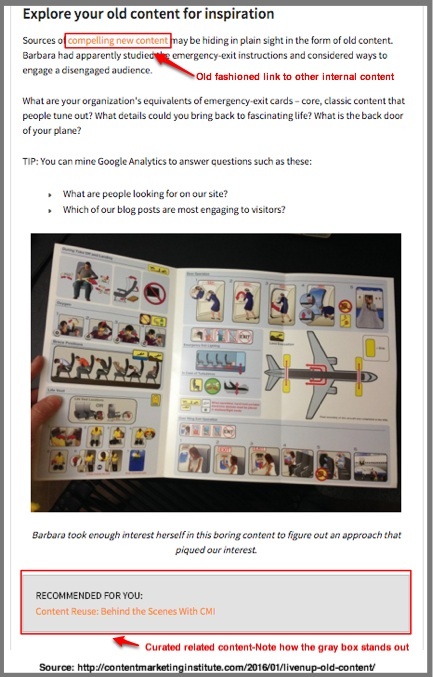 Guest posts and columns: This takes advantage of third party media entities. Do your homework and check that they accept them before writing. Update your existing content and hit publish. This is important for sites that have experienced a big gain in traffic and newer followers haven’t seen the old stuff. 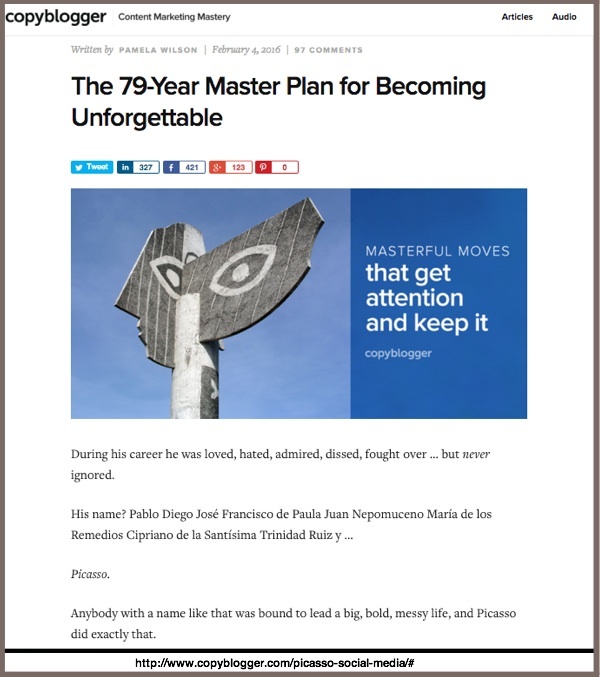 With its deep catalog of content, it’s no surprise that Copyblogger does this on a regular basis. They just did this with Pamela Wilson’s post on Picasso. It’s dated February 4, 2016 yet the comments date back to October 20, 2011. Check out Hubspot’s guidelines for republishing blog posts. Content Marketing Institute’s Joe Pulizzi hired a content curator to keep its content top-of-mind and yielding results. Positions you as a tastemaker. Uses other people’s audiences (OPA). Take a page from Content Marketing Institute’s curation playbook. See how they make the internal links to related content stand out? Unlike re-envisioning or curating your existing content, repackaging your content takes your existing information and transforms it into something new. It usually involves combining a number of pieces of content and adding new text and images. It’s best used for ebooks and presentations. For example, when he was at SAP, Micheal Brenner took the information requested for an executive presentation and turned it into a stand-alone LinkedIn Slideshare called 99 Facts on the Future of Business. To-date, it has 400,000+ views and it’s been updated. You have the ability to transform your orphan content into strong members of your content offering. Like children, they just need tender loving care in terms of additional creative and promotional support to make them enhanced existing content marketing. Have you tried improving your orphan content to extend its lifespan? Tags Content Lifespan, Copyblogger, Ian Cleary, Jason Miller, Laura Roeder, Michael Brenner, Noah Kagan, Orphan Content, Pamela Wilson, Rand Fishkin. Bookmark the permalink.